Megumu “Mego” Kobayashi is a 15-year-old girl. Her twin brother is Mitsuru Kobayashi, the older of the two. Megumu is a full-on otaku and a history nerd, while Mitsuru, the popular and successful high school jock, is terrible at history. One day, dark-haired Mitsuru concocts the idea that he should put on a blonde wig and dress up as Megumu and attend her school, Tosho High. Meanwhile, Megumu will wear a dark wig, dress like Mitsuru, and take his history exams. This is not the last time the twins will switch places, especially when love is involved..
As So Cute it Hurts! !, Vol. 6 (Chapters 26 to 30) opens, Megumu's friends discover that she is a budding mangaka, so they encourage her talents. She vows to practice every day, but her first sketching session in a park is interrupted by a young man who goes ballistic when he sees one of her drawings in particular. Who is Chiharu Uesugi? Plus, Mitsuru and Tokugawa come together in an unexpected way. THE LOWDOWN: The So Cute it Hurts!! manga is so fun to read it hurts when I get to the last page. Every time I think that I have seen all the cute this manga can throw in my face, I find that I need to keep reading cause there is fresh cuteness. Why stop when I'm having so much fun? So Cute it Hurts!! Volume 6 brings in the unexpected twist of Megumu's drawing skills. Creator Go Ikeyamada not only spins that into a way in which she can dig deeper in Megumu and Aoi's relationship, but also uses it to introduce a complication. Now, the Mitsuru-Tokugawa dynamic looks like equally fertile ground, so how can I not be keep reading until it hurts? 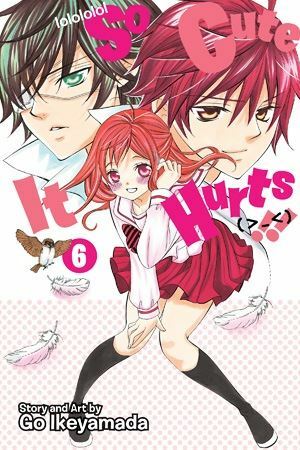 POSSIBLE AUDIENCE: Readers looking for high school shojo romantic comedies will want So Cute it Hurts! !